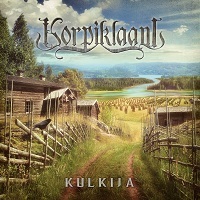 Overwhelmed by the constrasts that are usually a part of the genre which is all an adventure within itself, Folk Metal in the form of KORPIKLAANI delivers to this 2018 a tenth record worth the recognition of the previous works of the the Finnish Folk Metal Superstars, as they label themselves, but with the novelty of a new piece of work from a more complex and experienced band. Followed by the Wayfarer's Live album, a prof of KORPIKLAANI'S power and accuracy on stage, KULKIJA, their tenth full length album is focused on everything that happens to the one that decides to travel on feet through long distances with a steady and secure pace, almost as the one that is kept by the restless rhythm section of the accordian, with fills and changes worthy of the most complex form of music and choral arrangements that play both the part of a time machine and a dimensional vortex. Without a doubt one of the most famous and enigmatic bands in the whole world, the mystique built around bands like these, is quite an addition when providing an identity and persona to a group of musicians with little or no comparison within the world of Metal, then again some of the times, one can be disappointed when the music comes to the surface, but this is not, nor will it ever be (I think) the case with KORPIKLAANI, for the amounts of musical theory and production observed in this piece of work posses outstanding quality and dedication to create a wider and more diverse fanbase with every passing year creating a familiar road with fresh and new adventures to the ones that decide to travel with KORPIKLAANI. Tracks such as "Pellervoinen", an instrumental calling forth to get back in contact with the land while experiencing the mythical and reporting the outstanding creatures, atmosphere and contrast describing every quest worthy of being recorded in the vaults of the Metal Temple.